"Orphans, smile and be happy." This line, delivered in an emotionless Mexican monotone, was delivered as lip service to the Orphans who truly have nothing to be happy about. They have no family. They have no individual attention. They have no good food or warm bed. They are being taken care of by a poor parish who can hardly provide them with the comforts of home. They are urged to smile and be happy because sister Encarnacion has joined the parish to minister to them. There is no enthusiasm. There is no love. The only individual who actually engages in dialog, service and play with the children is Ignacio, & he is seen as a useless individual by the brothers. Scripture & God himself (the ultimate author of scripture) is very concerned with social justice. He constantly reminds His people to be conscious of the poor and care for the orphaned. He wants justice & mercy rather than sacrifice. Elijah decided to stay with and care for a widow. We are constantly reminded to beware lest we fawn over the seduction of riches. Don't believe me? Read the book of James. Jesus loved to ratchet up the level of responsibility. He said if you hate your brother then you're a murderer. He said if you look at a woman with lust you've committed adultery. He also wrapped the poor, widowed, orphaned & alien into one large class of people: the least of these. 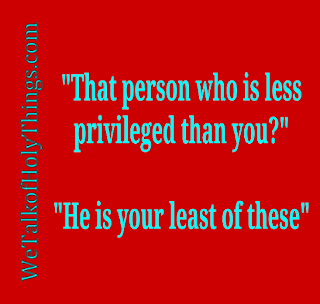 That person who is less privileged than you? 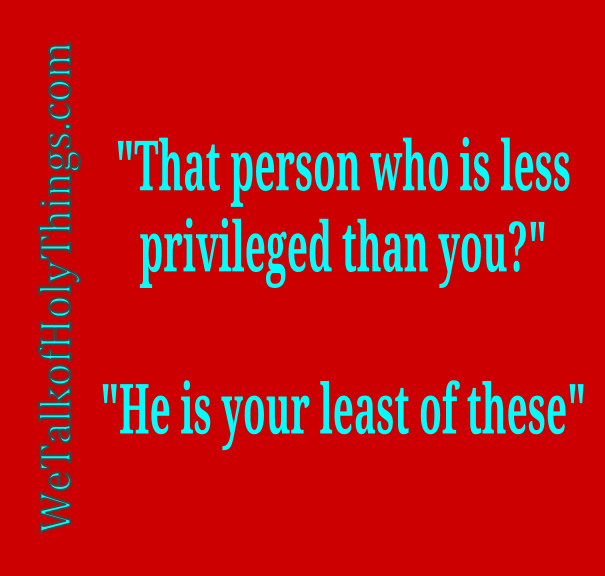 He is your least of these. We can't tell them to keep warm without clothing them. We can't tell people to smile and be happy without providing some kind of fellowship with them. Our activities must match the words that come out of our mouths. If not, we are not following the Lord Jesus. Do you know people who are less privileged than you? Show them some compassion. Are you already showing compassion? Let them know how you are doing that. Tell them you are praying for them or that you love them. Step out of your circle & into theirs. Remember that these principles are both spiritual & physical. Perhaps you know someone who is materially gifted yet spiritually impoverished. Care for them. Pray for them. Minister to them. You could have something to offer that will satisfy their greatest need. You may find the blessings will come back to you.